"Moshi Moshi" is a generic greeting used when answering the phone. It is also a festival held around Japan as a way to celebrate their culture for others (like foreigners). After learning more about it (from a source that we don't remember), we visit Moshi Moshi Nippon ("Hello, Japan") in Tokyo in late November to see what it's about. It turns out that it was a lot of fun! As foreigners, we got a free pass to go in, so that just adds to the awesomeness. 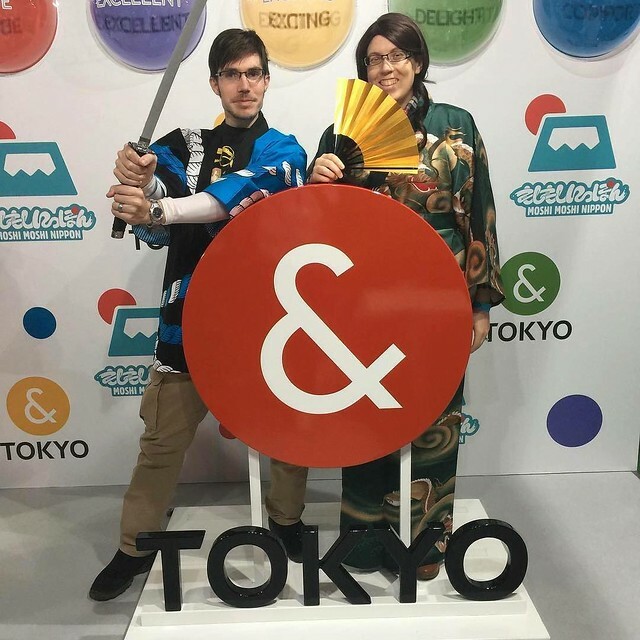 Inside the building, we saw a bunch of booths offering everything from ninja lessons, to makeup demos, to trip plannings, and even calligraphy classes and virtual reality! Overall, it felt like JapanFest in Atlanta, if you've ever been to that. If you haven't, we highly suggest it. Although Moshi Moshi may have been a bit smaller than JapanFest (JapanFest has about 200 booths and 10,000 people, while Moshi Moshi had about 30 booths and probably 3-4,000 people total), it still offered somethings that were unique to Japan, and to have the festival actually in Japan was a treat. There are a few photos that we took while browsing around, finding various things in Tokyo that we liked, and various mascots - including a metallic flying dragon (sorry Kaiba, no Blue Eyes) that Keat rode advertising the Robot Restaurant. We couldn't do much filming inside the festival, as Japan has a few odd publicity issues, but we did get a bunch of footage of us trying out new things. We didn't spend all day at Moshi Moshi, only about 3 hours - since we were in Tokyo, we decided to explore a bit, including Tokyo Tower, but that would have made for a very long video, so make sure to check out Part 2: Exploring Tokyo!